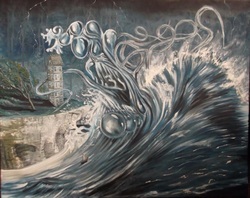 Kate Evans is a contemporary fine artist who would describe her art as Surrealist style. She graduated witha BA Fine Art in 2010 and has recently gained a PGCE qualification. She continues to create her art at all times, expanding her boundaries, exploring the world through bizarre dimensions. Born and raised in South Wales, Evans was a very gifted artist from a young age, remembering how astounded herprimary school teacher looked when she painted for the very first time something that resembled an actual rose. As a maturing adolescent she discovered her distinct style and a fondness for painting very bizarre but personalnarrative subject matter. In discovering surrealism, she maximised her imagination and continuously came up with ever more strange and fantastical ideas which she painted straight away with energetic and brilliant haste. She then began her journey towards becoming a professional oil painter through fine art training at the Universityof Wales Institute, Cardiff. Her innate passion for expressing her subconscious and spontaneous thoughts in canvas and paper along with hermastery of technique in oil and graphite was soon recognised. In Cardiff and the surrounding areas, Evans was acclaimed as an exceptional new talent, praised for her strange imagery and the way each one of her paintings toldan interesting and wonderful story. Her universe of characters and distorted montages of pop culture imagery drew attention from established art collectors, galleries and magazines, propelling her to the forefront of a new artmovement. Whilst her style matures and her colours intensify, they retain her signature of thinking beyond the realm of reality, or at least the one we all know, and through her own personal imaginative lens she is able to project all those whohave enjoyed her work into a world of wonderful, impossible fantasy.